To the best of my knowledge, this is the first time that the saxophonist Phil Chester has put his music down on record. And what a fine record it is. To those who have heard him live, this would come as no surprise. To those who, like me, are hearing him for the first time this is a most welcome release, carefully planned and handsomely presented complete with original artwork by the saxophonist himself. 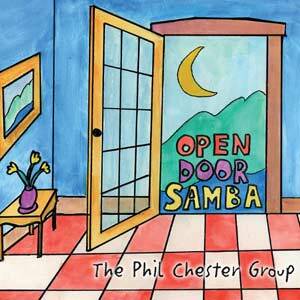 And what is most interesting, of course, is the title of the record: Open Door Samba. Clever, I thought. Using the metaphor of the door, no doubt opening to let a melange of music in. And then there is this: The Brasilian Thing so subtly stirred into the mix with just enough to hint at Ipanema and all its sensuousness complete with not-so-chaste beauty and radios chattering with the sound of the world. This is a Brasilian record. But not in the way you would expect. True it opens with a samba and has a bossa just after it’s half way in. But the Brasilian-ness is far more subtle referring, as it does, to the broader nature of the word “samba”. In Brasil that means ‘to dance’. And that’s exactly what the record suggests you should be doing. And it is suggested that you let the “Open Door Samba” prepare you to shuffle in the sand or down a dusty road if you must. But dance you will be doing because this album is brimful of the kind of visceral energy that takes you by the hand and lifts you off your feet. Captured as such you will be amazed at the magical and seductive miniatures in the repertoire, the chiming magic of “Pastor” a wonder of visual suggestiveness. Or fall prey to the charms of “Earth And Sky” emerging as if through some dream-like opalescent haze. But make no mistake; there is also a blinding rhythmic force that drives much of the music here. Still, there is such free thinking, ease and fluidity are a radical departure from musicians these days who seem to try too hard. You get a sense that here is a generous-hearted artist who delights in playing his music and it shows. 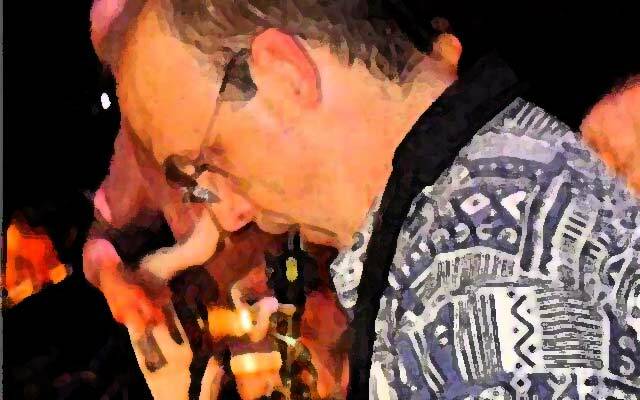 Phil Chester’s sound can make your head spin here; so seductive are his colour and inflection, and you will search far and wide to find more sheerly beautiful playing. The fact that Mr. Chester is not addicted to the limelight can also swing both ways. His diffidence will make it harder for him to find commercial success and he runs the risk of leaving the stage much too early in his career for virtual oblivion. But such doom be damned because Phil Chester makes a wonderful leader, who is not afraid to recede from the limelight to let other members of his Group shine. And they, of course, end up paying him back in kind. We can only hope that there will be an awful lot more to come from Phil Chester and The Phil Chester Group for much is expected from them. Something tells me we will not be denied. This recording is only the beginning. Track List: Open Door Samba; Pastor; Water; Round The Block; Earth And Sky; Kyrie; Second Son; April Bossa; Yen And Yang; Pogi’s Plight; Waltz For Fern; Cactus Blues. Personnel: Phil Chester: soprano, alto and tenor saxophones; Bob Quaranta: piano; Ian Froman: drums; Leo Huppert: bass (1, 3, 4, 6, 7 & 11); Joe Fitzgerald: bass (2, 5, 8, 9, 10 & 12); Katie Jacoby: violin; Tomas Ulrich: cello. Studied at North Texas University and Univ. of Texas. Toured with Glenn Miller Orchestra in the mid 80’s Played with NJSO, St. Luke’s Sym. Orchestra, New Jersey Pops Played and toured with numerous Broadway shows. Currently playing “Phantom of the Opera.” Frequently appears at productions at the Papermill Playhouse in NJ. Frequently appears at the Rainbow Room with the New Deal Jazz Orchestra. Composes for and leads own quartet.